The PROTO-8 is an extended length (9.00"L) 8-Bit prototyping card for use with the industry standard PC/104 bus architecture. The large breadboarding area is ideal for evaluating circuitry prior to committing to actual printed circuit board etch. It is also useful when constructing permanent designs where only a few articles will be built. Version 'B' comes with a solderless breadboarding area which allows rapid construction and rearrangement of the user's circuitry. Access to all J1/P1 PC/104 signals are simplified by means of connectors which accept 20-28AWG solid wire. Once the circuits have been proven, they can be disassembled and the PROTO-8 reused on the next design. The 'S' version provides a grid of over 2000 solder-pad/wire-wrap holes on 0.1" centers and is intended for permanent construction. Both versions feature on board circuitry for buffering the data lines, address decoding, and providing decoded I/O control logic. The control logic is in the form of a socketed GAL, which can be reprogrammed by the user to customize the PROTO-8 for specific applications. 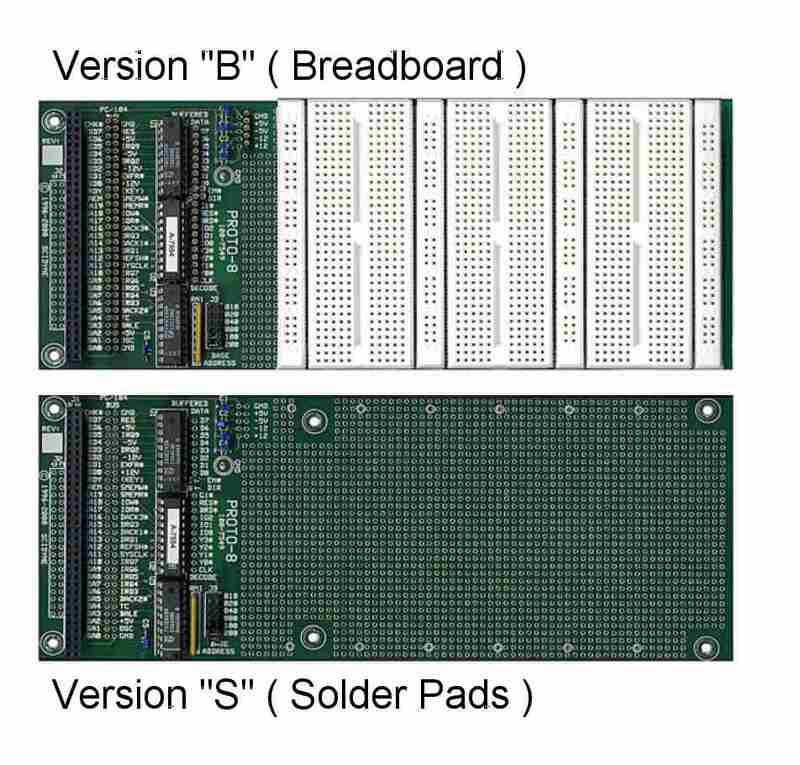 "B" Version: Solderless breadboard. 8 distribution strips, 3 terminal boards. Socket strips for access to all PC/104 signals, decoding and power. Accepts 20-28AWG solid wire and component leads. "S" Version: Solder pads. 2000+ pads, .036"dia. Holes on .1" centers. 2 I/O Write strobes, 2 I/O Read strobes. Each strobe occupies four consecutive I/O address spaces. Uses socketed GAL16V8. Pinout compatible with PEEL18CV8, EP310 and other 20 lead DIP devices. NOTE: The factory supplied configuration can be changed by reprogramming the GAL. Customization requires Verilog, VHDL or other language/design software and a GAL programmer which is not supplied with PROTO-8.